Bangladesh is one of the densely populated countries in the world. She is bearing 142.3 million of people in her 1, 47,570 sq km of areas (Wikipedia, 2011). Out of them, about fifty percent (105:100) are female. They are the key operator of the house. They play an important role in domestic duties such as washing utensils, cleaning house compounds, livestock and poultry management and feeding, as well as post-harvest activities, guest entertainment, decision making and technology adoption. In addition, rural women do some productive activities including agricultural within the homestead (Halim and McCarthy, 1985). Women in Bangladesh are responsible for grain processing and storage. They grow most of the family’s fruits and vegetables and participate in post harvest activities. They care for poultry and livestock. Yet women’s contribution to agricultural and household production receives less recognition than their domestic and child-rearing chores which are economic tasks in our view (Kabir et al., 1977). According to the WBB (2008) study, 81 percent women are directly involved in household activities and only 60 percent men assist them in doing their works. The study also revealed that a housewife spends 16 to 20 hours a day for household works on an average by engaging herself in 45 types of work. “If the professionals would have done the works, its monthly economic values could be Tk 10,000 and if we consider the household activities as a whole, it would stand at $ 91 billion a year. Women have no holiday and even no leisure time. Many activities performed by them are not considered as the productive ones and hence not reflected in national census. Secretary-General, Ban Ki-moon (2009) says that women’s unpaid work at household level, including care giving, remains “invisible and unmeasured”. Rather they take care of both the children and elderly people of the family whenever they get time to take little rest. They involved in agricultural activities, cattle and poultry farming, handicrafts, cooking, fetching water, cleaning the house, taking care of family members and many more. Without women’s participation household activities cannot be performed perfectly. But it is interested to note that independent decision making by women on all home and family related practices is very marginal (6.9-13.1%) even though family and home is essentially a women’s domain (Anon., 2005). Presently, due to extreme poverty and a food crisis, social norms and traditions are changing and they are intimately involved in all phases of agricultural activities: from sowing seeds to harvesting and processing of crops. They are also involved in different earning activities like sewing dress, making baskets, making papers, flower vases, rearing of poultry, livestock and in different small scale business. Even women from the poorest households sometimes work outside the home as paid laborers for their family survival. Ahmed et al. (2008) observed that the economic status of respondents’ family was developed due to homestead farming by the women. Livestock is an important component of the farming systems in Bangladesh, and cattle, goat and poultry are the most commonly reared animals. It is hard to walk around a village without seeing hens, goats, cows, and buffalo’s etc. Women are responsible for 60 to 80% of the feeding and milking of cattle. They also engaged in various activities related to livestock production like production of animals, sales of animal’s products and by products, cleaning, watering and bathing the animals. In Bangladesh, women are in general responsible for livestock and poultry rearing. Poultry rearing is a traditional activity performed by women for income generation. Feeding livestock, cleaning sheds, securing them properly for the night, and health care are the activities performed by women. From above discussion it is crystal clear that women mostly participate in farming as well as household activities and they are the household managers but their work is considered as non-productive, unorganized and un-documented throughout the world. They are deprived of not only in the field of agriculture, but also in all other fields like education, nutrition and health. Keeping this view in mind, the present study was designed to answer the following questions. What are the socio-demographic characteristics of the women which influence them to participate in household and agricultural activities? What is the degree of rural women’s participation in household activities? What is the extent of rural women’s involvement in agricultural activities? What is the relationship between selected characteristics of rural women and their participation in household and agricultural activities? To find out the relationship between selected characteristics of rural women and their participation in household and agricultural activities. The selected respondents were competent enough to furnish proper response to the queries included in the interview schedule. Views and opinions furnished by the respondents included in the sample were representative, valid, and reliable of the whole population of the study area. The content of items, questions, and scale of measurement of the variables were reasonably authentic to reflect the real life situation of the respondents and the thrust and objectives of the study. The findings of the study are expected to have satisfactory appliance for planning and execution of various extension programs, strategies, and approaches. The data provided by the respondents were free from bias. In order to keep the study under manageable limit, meaningful, and considering the time, money and other necessary resources available to the researcher the following limitations were recognized. 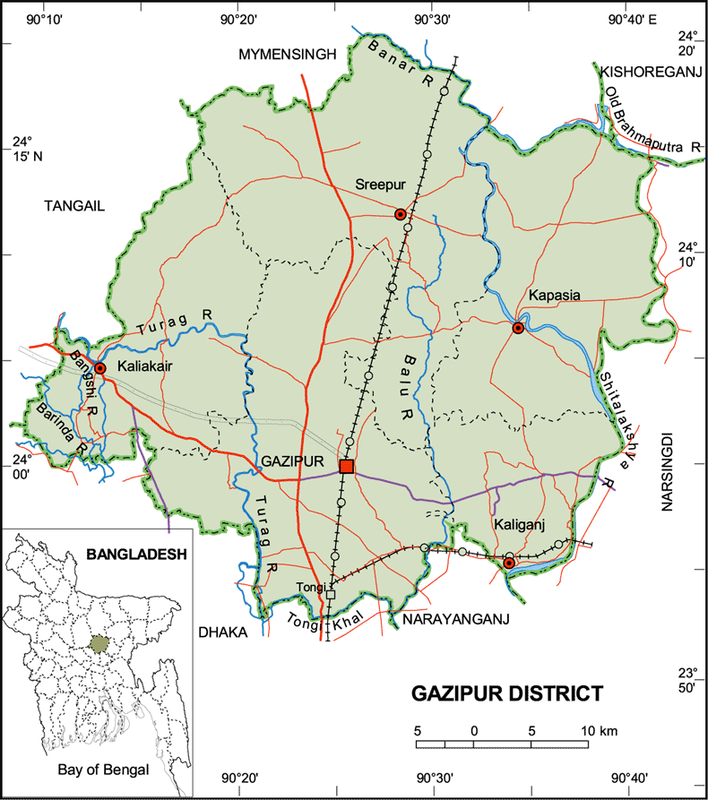 The study was confined to only three villages of Gazipur sadar upazila in Gazipur district. Only nine characteristics of the rural women were selected for this study. The researcher dependent upon the information furnished by the respondent. The purpose of this chapter is to review the literatures having relevance to the present study and to formulate and construct a framework that will be befitting for accurate understanding of the research problem. Studies related to participation of women in agricultural activities, participation in selected household activities have, therefore, been reviewed in this chapter. Findings of the study dealing with the relationships of the selected characteristics of the rural women with their participation have also have been briefly discussed in this chapter. Available literatures on the participation of rural women in household and agricultural activities are very few in Bangladesh. However, some interlinked literature on this aspect from home and abroad have been presented in the following sections. Accordingly, the researcher tried her level best to collect required information by thorough searching of related literature, journals and periodicals and putting them together at the end of this chapter. The collected information is presented under the following sections. Blumberg (1979) reported that women’s agricultural work is invisible, under reported and their household production is even more invisible. 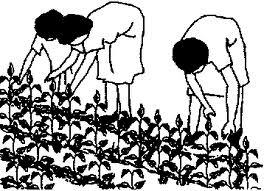 Ferguason and Nancy (1985) urged the importance of recognizing women’s agricultural and house hold production in the development and introduction of cowpea and bean plants. They indicated that the concern of women as food producers and preparers were often overlooked in male focused main agendas. Schoeffel (1983) reported that productive inputs of women in the total society of Papua New Guinea have been significantly greater than those of men and inclusion of their contribution to domestic work would prove further that women do carry a heavier work load. Sofilios and Mahmud (1989) showed that household production was in the hands of women. The major task and decision regarding homestead vegetables and spices are become an increasing source of income for rural household. Hussain (1985) showed that women were involved in most of the pre and post harvest operations of vegetables production. They also advocated some measures to be taken by the government, policy makers, planners, development workers and researchers for the effective integration of participation in different homestead production and management activities like vegetables growing, livestock raising, fish cultivation, post harvest operation like processing and household decision making etc. Satter (1985) observed that women participation in the post harvest operations, vegetables cultivation, fruit cultivation, livestock care as well as other economic activities which had a great contribution in the family income. Sudharani and Raju (1991) reported that household based subsidiary professional program such as cattle production, poultry rearing, sericulture, mushroom culture and fruit preservation might generate extra employment opportunities for the farm women and gradually few proceed to these operations. Castillo (1985) reported that in the Philippine rural women contribution mostly in transplanting, harvesting and care of animals, processing and marketing of procedure. Ali and Rahman (1978) reported that women were engaged in both productive and household activities. The production or income generating activities unproved their socio-economic conditions. Quddus and Bose (1985) reported that the kitchen gardening, home gardening and home level food processing was satisfactory and profitable and women’s participation was high with strengthening extension work. They also advocate that with the existing social system homestead gardening may be considered a major area for women which have both economic and nutritional implications for the well-being of particularly for the poor unemployment women. Savita et al. (1998) found that participation of rural women in agricultural activities was low except for farming, nee keeping and rabbit farming. Along with major role in household activities, rural women engage in different economic activities such as food processing (25%) and participation of detergents supply (15%) supplement family income. The major constraints reported were: marketing problem, transport, procuring raw materials, lack of technical knowledge and no loan facilities. Anonymous (2005) reported that a high percentage of independent participation by women (43-81%) in all homestead activities like cooking, cleaning, collection of full fetching water, care of children and elderly etc. Independent participation of women in major crop production, post harvest (2%), livestock management (6%) and entrepreneurial activities was nil. It is interested to note that independent decision making by women on all home and family related practices was very marginal (6.9-13%) even though home and family is essentially a women’s domain. Hossain et al. (2004) found that participation of tribal women in homestead vegetable production was from low participation (below 3) to high participation (above 4). Karim and Wee (1996) mentioned that women were involved in seed collection, seed storage, water management, fertilizer application, and daily maintenance and harvesting. In case of tribal people, vegetables were growing mostly cared by women. Urban women were also eager to grow vegetables in the homestead. Islam and Dham (1994) reported that women member of the cooperator farm families participated in all the operations needed for homestead gardening whatsoever. It was a pleasure to note that women participation in two activities e.g. weeding and stalking more than man and it was sole (100%) in works like irrigation and harvesting. It implied there was scope for utilization of women labor in crop production activities that might help increase farm income as well as family nutrition intake. Aireen (1992) in her study identified women’s contribution in farm family in terms of participation in homestead farming and household activities. She also denoted women’s status in decision-making process in family affairs. She found that on the average women spent 30% on day time in household activities and 70% on agricultural activities. Women contributed 58-235 labor days per hectare for production of homestead vegetables compared to 50-221 by men. It further revealed that women earned on an average Tk. 4359 per year from various income generating activities. In case of decision making men enjoyed overwhelming right to make major decisions. Schulze & Sostres (1991) stated that women’s involvement and contribution role in livestock production has often been underestimated or, ignored and they also reported that women’s work is rarely considered “economically important” for the nation. Hossain et al. (1988) reported that women constitute about 48% of the total population in Bangladesh. Even then their role is not adequately reflected in the national census and development activities because of lack of necessary information and documentation on homestead agriculture. It is, therefore, imperative to collect and document data from gender perspective and by different socio-economic classes for meaningful insight into the working pattern and contribution of women in homestead agriculture production system. Halim (1987) mentioned that women are potential producer of the homestead agricultural products and participate intensively in homestead production activities. But due to lack of knowledge and utilization of proper technology and manageable practice, the production remains below the accepted level. It may be due to the lack of communication understanding of their beliefs by the change agents. So, it is a crucial need to know the gap between existing beliefs and performances of our rural women regarding homestead production activities. Dey (1985) mentioned that in his research article that women in the household are economically active and played important role in post harvest operations as well as activities like kitchen gardening and livestock. Anonymous (1986) observed that women can perform post harvest operation such as drying ,winnowing, and storing paddy, cleaning and drying wheat, storing mustered and pulse, cleaning and storing potatoes, drying and storing of spices and extracting fiber and seed of jute. Martius and Harder (1985) in a survey found that women in the rural household perform a number of economic activities viz. post harvest activities, tree plantation, poultry rising, vegetables gardening and fuel gathering etc. But these contributions of the women are not recognized and remarkable as well. It is observed that when any initiative is taken to teat women as recognized and remunerative labor force, the traditionally ‘purdah’ norm acts as a barrier. Brammer (1983) in a study pointed out that woman do a large extent for cultivation of vegetables and fruits. Sathar and Desai (1996) observed that women, living in nuclear families participate more intensively in household activities. Agha (2005) reported that in rural areas women fully involve during the whole day in domestic labor activities like looking after the children, cleaning the house, cooking, washing and the many other activities. Lloyd et al. (2002) reported that although their participation in agricultural and household activities are very high but the educational facilities and enrollment of female in primary education is hopeless because their enrollment has stayed roughly the same for the country as a whole, at about 30% . World Bank (1995) study that other than education women’s full participation in economic and household activities impeded by cultural and legal constraints, which limits women’s participation by women’s relative lack of time and mobility due to their workloads and multiple roles. Shaheed & Mumtaz (1990) reported that women often devote more time and their participation is notably higher in food storage and processing than men. They carry out these tasks in addition to their normal household activities. Huq (1981) reported that unmarried women use more of their time during pre marital stage than married women in labor force and 70 percent of workers of her study belongs to the age group of 15-24 years. Seema (1985) reveals from her study that nature of farm activities participated by women varied with age. Participation of showing, harvesting, and storage were dominated by women in age group of 24-40. Participation in irrigation and plant protection measures was confined to young women (below 25 years). Nair (1963) made a review of the research done on method and procedure of adopting improved technology and farm practice and the relevant factors associated with them. He found age as one of the factors that influenced the farmer’s participation process. Akanda (1994) stated that education of rural women had significant positive relationship with their participation in the cultivation of fruit trees. However, there was a positive relationship between education and homestead vegetable cultivation and that of non-farm activities but was not significant statistically. Shah (1989) pointed out that in Philippines; women’s educational level has highly significant relationship to women’s participation in rice farming systems. Khan (1983) found that the rural women’s educational level had positive relationship with their participation in community activities and income generating projects in Bangladesh. Farouq (1979) found that women were the disadvantage class in the society; they were ignorant, illiterate and helpless and also worked much harder and suffer more. Women as a class bore the burden of poverty more than men. He observed that access to primary education and available technologies might provide women with improve life. Arya (1979) in her study on women’s role in decision making in farm credit found that family education had no significant relationship with women participation in decision making. Singh (1982) found that family education of the farmers was positively related to agricultural technology and this relationship was statistically significant. Kumari (1988) from the study on communication effectiveness of selected six media showed that was a significant relationship between education of women and attitude towards the massage knowledge level. Kaur (1988) observed that education influenced the opinion of the women about the project activity and adaption of vegetables gardening, animal husbandry etc. Rahman and Haque (1988) reported that no significant progress in women’s education and training is desirable between 1974 and 1981. Female literacy rate during this period improved from 13 to 18 percent and through the rate of growth for female literacy was a bit higher, overall women’s literacy rate remains half of men. Akanda (1994) mentioned that family size of the rural women had significant positive relationship with their participation in the plantation of fruit trees. The relationship with homestead vegetable cultivation and non-farming household activities was not significant. Akhter (1989) in her study found that family size of the rural women had significant negative correlation with their attitudes towards homestead production. She remarked that the household women with large family had low attitude towards homestead production because of heterogeneous opinions of the large family. Khan (1983) showed family size of rural women were not significant related to the extent of women’s participation in the community activities and income generating projects in Bangladesh. Shah (1989) also observed that family size is not significantly related to women’s participation in rice farming systems. He also reported that the large the family size the greater is the threat of economic solvency. Mustafi et al. (1987) in their study found that number of family members had no significant effect on adoption of modern varieties of rice of Bangladesh. Halim and McCarthy (1985) reported that women performed different types of economics activities like post harvest, vegetable gardening, livestock care etc. and their rate of involvement depended on family structure. Roxas-Aleta et al. (1977) the family size preference of urban women is found lower than that of rural women. The higher the level of education and occupation, the lower is the family size preferences. Hayami et al. ( 1976) A study on labor utilization in a rice village of Southern Luzon of the Philippines observed that the average family size of the farms was found higher than those of small farms. The study also reported that female labor force participation was higher in small farms than in large farms. Paul and Saadullah (1991) reported that only 36% rural women are familiar with crops extension personnel yet 90% of rural women are involved in crop productions. Only 19% and 6% women are known to livestock and fisheries extension people respectively. But 87% adult women are familiar to family planning people. Khan (1983) reported that there was a strong relationship between women’s exposure to media and their participation in the community activities and income generating projects in Bangladesh. Research methodology is a structured set of guidelines or activities to generate valid and reliable research results. Various methods and tools and techniques were used during different stages of research work. Appropriate methods used in research help collect reliable data and analyze the information to arrive at correct decision. Research methodology is the description, explanation, and justification of various methods of conducting research. It is considered as the foundation of research process. Broadly speaking, methodology is the underlying principles and rules of organization of philosophical system or inquiry procedure (Urdong, 1968). Thus, “methodology is the systematic and logical study of the principles guiding scientific investigations (Gould and William, 1964). Selection and adoption of appropriate research methodology is related to the nature of the problem to be solved and the study objectives (Abedin, 1996). Methods and procedure followed in conducting this piece of research are discussed in this Chapter in the following sections. Research design is the comprehensive plan of investigation. It is the blue print of the complete procedure of testing the hypothesis and analysis of obtained data (Ray and Mondal, 1999). The descriptive and diagnostic research design was applied in the present study. Because descriptive research design helps in stating characteristics of a particular situation, or a group or individuals and used for fact finding with appropriate interpretation. On the other hand, diagnostic and analytical research design helps in testing of hypothesis and specifying and interpreting relationship of variables. The unit of analysis is the most basic part of the event to be studied. It influences the research design, data collection and data analysis decisions. Adult housewife was the main unit of analysis of the present study. Three villages namely Kanaia, Nilerpara, Chakuli of Gazipur sadar upazila were selected as the locale for this piece of the study. The researcher is well acquainted with these villages along with the farming communities, rural families and rural people as well Because of this close association, the researcher selected these villages as the locale of the study. Metallic road adds facility to the villagers’ communication well up to Gazipur sadar upazila. A number of GOs and NGOs have been working in the villages for the development of agriculture sector and women as well. 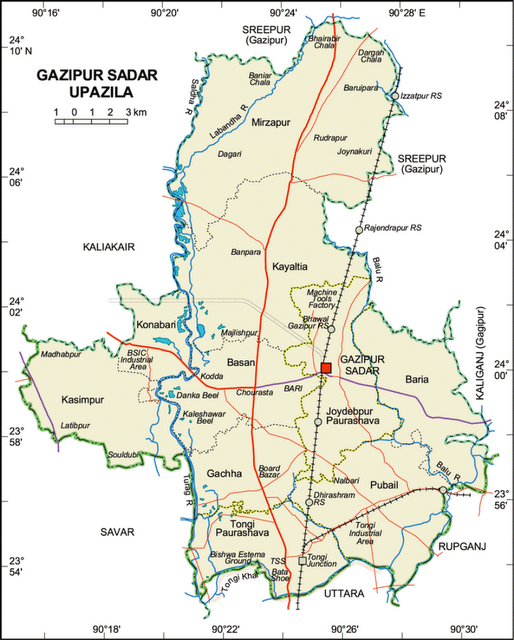 A map of Gazipur district showing Gazipur sadar upazila and another map showing the study area had been presented in Figure 1and 2, respectively. All the housewives of the selected three villages were the population of the study. The researcher herself collected a list of housewives from the office of the Upazila Health and Family Planning Officer (UHFO) of Gazipur sadar upazila. An updated list was prepared with the help of local leaders, SAAO and local NGO workers. Thus, a total of 345 housewives (Kanaia 130, Nilerpara 105, and Chakuli 110) were considered as the population of the present study believing that each family contained only one housewife. And from them ninety housewives were selected as sample using stratified proportionate random sampling. A reserve list comprised of nine housewives was also prepared for using only when a respondent in the original list remained unavailable during the time of interview. In order to stockpile pertinent information, an interview schedule was prepared carefully with due patience keeping the objective of the researcher in view. The questions and statements contained in the schedule were simple, direct, and easily understandable to the rural community. The schedule contained both open and closed form questions. Appropriate scales and techniques of measurement were applied to ensure correct responses of the variable concerned. In order to improve, finalize, and make the interview schedule reliable, it was pre-tested under real life situation. Necessary corrections, alterations and adjustments were made accordingly in the light of the actual and practical experiences and result of the pre-test. An English version of the interview schedule has been presented in Appendix-A. Data were collected personally by the researcher herself through face to face interview. The researcher made all possible efforts to explain the purpose of study to the respondents. Rapports were established with the respondents prior to interview and the objectives were clearly expressed to avoid any biasness in data collection. Excellent co-operation and coordination was obtained from the respondents. The entire process of data collection took 30 ranging days from February to March 2011. Data collected from the respondents were coded, compiled, tabulated, and analyzed in accordance with the objective of the study. Qualitative data were converted into quantitative form by means of suitable scoring whenever needed. The researcher employed adequate care in selecting the variables of the study. Considering personal, economic, social and psychological factors of the rural community, time and resources availability to the researcher, reviewing relevant literature and discussing with relevant expert, the researcher selected the variables for the study. Two types of variables e.g., independent and dependent variables were used in this study. Townsend (1953) defined an independent variable as that factor manipulated by the experimenter in his attempt to ascertain its relationship to an observed phenomenon. He also defined a dependent variable as that factor which appears, disappears, or varies as the experimenter introduces, removes, or varies the independent variables. However, the selected characteristics like age, level of education, family size, farm size, media exposure, coping capacity to household shock, husband-wife relation, contribution to purchase, involvement in social development programs were considered as independent variables of this study. The parameters like participation in household and agricultural activities were the dependent variables of the study. The procedure followed for measuring the variables of the present study have been described below. It refers to the number of years from the date of birth of a respondent to the date of interview. It was recorded by asking her actual age in years in a nearest whole number. The family size of a respondent refers to the number of individuals in her family including herself, her husband, children and other dependants at the time of interview. The total number of the family members was considered as the scores. Occupation refers to an activity that serves as one’s regular source of livelihood. It was computed using a 3-point rating scale assigning scores of 01 for housewife and 02 for ‘ service’ and 3 for ‘others’, respectively. Education of rural women refers to the year passed from the formal educational institution at the time of interview. A score of one (1) was given to a respondent for each year of schooling. A score of zero (0) was assigned to those who were illiterate. However, who did not know how to read and write but could sign his/her name only was given a score of half (0.5). Media exposure refers to the extent of access to different 10 selected media i.e. health worker, nutrition worker, NGO workers, SAAO, fisheries assistant, group meeting, listening radio, watching television, and reading newspaper by the participants. To measure frequency of their contact a 6-point rating scale composed of ‘no contact at all’, ‘yearly contact’, ‘half-yearly contact’, ‘monthly contact’, ‘weekly contact’ and ‘daily contact’ against ‘0’, ‘1’, ‘2’, ‘3’, ‘4’ and ‘5’, respectively. Thus, the media exposure score of a respondent could range from 0-50. Coping capacity to household shock refers to a women’s ability to face sudden risk, crisis and periodic stresses in the household. Nine major risks in various aspects related to household management including crop failure, burning of house, job termination, loss of physical fitness, immature death of children, breach of relationship with husband, loosing capital and withdrawal of NGO support, divorce of any family member were considered. Respondents were asked to indicate their agreement on a 4-point rating scale consisted of ‘no coping capacity’, ‘little coping capacity’, ‘medium coping capacity’ and ‘high coping capacity’. Scores of ‘0’ ‘1’, ‘2’, and ‘3’ were assigned against the above items, respectively. Thus, household shock coping capacity score of a respondent could range from 0-27. The husband-wife relation of a respondent refers to the extent of relationship between husband and wife ranging from not in good relation, respectable, cooperative and amiable. It was computed using a 4-point rating scale assigning scores of 0 for ‘ not in good relation’, 01 for ‘respectable relationship’ and 02 for ‘ cooperative relationship’ and 3 for ‘amiable relationship’, respectively. Contribution to the family purchase refers to the extent of respondent’s contribution to purchase different items in terms of percentage. To measure this, each respondent was asked to indicate the amount of money spent against nine selected items on a 4-point rating scale: 03 for ‘higher contribution’, 02 for ‘equal contribution ‘ and 01 for ‘low contribution’ and 0 for ‘no contribution at all’. Hence, a respondent contribution to purchase could range from 0 to 27 where ‘0’ indicating no contribution and 27 indicating very higher contribution. Involvement with social development programs refers to the extent of respondent’s participation in execution of some national programs by the government and nongovernmental organizations for social development in their community. To measure this, each participant was asked to indicate her extent of participation against six items (Item # 9, Appendix: A). It was computed using a 4-point rating scale using a score of 03 for ‘frequent involvement’ ,02 for ‘often involvement ‘ and 01 for ‘rare involvement’ and 0 for ‘no involvement at all’. Respondents’ participation in household and agricultural activities has been measured below. Participation of respondent in household activities was measured in terms of extent of their involvement with the different selected activities viz. participation in food preparation, clothing activities, children’s education, housing, family planning and other household activities. To measure this, each respondent was asked to indicate her extent of participation in each activity which was calculated in percent. Thus, a respondent’s involvement could range from 0-100% where ‘0’ indicating no participant and 100% indicating full participation. (Item # 10, Appendix: A). Participation of respondent in agricultural activities was measured in terms of extent of their involvement with the different selected activities viz. participation in pre- harvest activities, post- harvest activities, rearing poultry, livestock, and fish culture. To measure this, each respondent was asked to indicate her extent of participation in each activity which was calculated in percent. Thus, a respondent’s involvement could range from 0-100% where ‘0’ indicating no participation and 100% indicating full participation. (Item # 11, Appendix: A). The SPSS/PC + computer program (Statistical Package for Social Sciences) was used in processing analysis of data. Descriptive statistical measures like range, mean, number and percentage distribution, standard deviation were used to describe and interpret the data. For exploring relationships between variables Coefficient of Correlation (r) was used. If the computed value of coefficient of correlation ‘r’ was equal or greater than that of corresponding tabulated value, the null hypothesis was rejected and it was concluded that there was significant relationship between the concerned variables. However, when the computed value of coefficient of correlation was found to be smaller than that of corresponding tabulated value, it was concluded that the null hypothesis could not be rejected and hence there was no significant relationship between the concerned variables. Throughout out the study five percent (0.05) level of probability with an accompanying 95% level of confidence was used as a basis for rejecting or accepting the null hypothesis. The results and discussion section is one of the most important part of a research report. This Chapter deals with the systematic and logical presentation of the findings of the investigations followed by adequate interpretations. Findings of the study and interpretation of results are presented in this Chapter in four` sections. First section deals with the selected characteristics of rural women. Second section deals with their participation in household and agricultural activities. Third section deals with the relationships between the selected characteristics of respondents and their participation in household and agricultural activities. Fourth section deals with the problems encountered by their participation in household and agricultural activities. In the present study, nine characteristics of women were selected for investigation. These characteristics were age of the respondents, household size, occupation, education, media exposure, coping capacity to household shock, husband-wife relation, contribution to purchase, participation in social development program, participation in household and agricultural activities. Age is an important factor that leads and controls the spirit of an individual to achieve any goal and objectives. Table 1 represents the respondents according to their age. Age of the respondent ranged from 18 to 70 with an average of 35.8. Based on their age, the respondents were classified into three categories as of Hoque (2007). More than three -fifths of the respondents (62%) were young aged while 36 percent belong to the medium and old aged. Similar results were reported by Hoque (2007) and Imran (2011) in their respective studies. Education makes human beings great, wise and honorable. Respondent women as the half of society have the same human right and have to come forward for education to become an affectionate mother, loving sisters, dutiful wives and above all intelligent social beings. Education is regarded as an instrument of change and transformation of society. Education can be seen in the emancipation of women from the patriarchal society. As women educated, they acquire a base of critical thinking and independent judgment. Educated women are less content to devote themselves exclusively to domestic tasks and interested to outside activities (Blood, 1972). It is important key to improve health, nutrition, and family education and to empower women to participate in decision making process. A woman who is able to read letters was considered as literate under the present study. Findings presented in Table 2 depict the distribution of the respondents according to their level of education. It is evinced from the table that about 91 percent of the respondents had literacy. About 30 percent of the respondent can sign and 20 percent were belonging to the group of primary level of education, while 41 percent were belonging to the group of secondary level of education. Only 9 percent of the respondents were illiterate. This is obviously good sign of the study area. Paul et al. (2001) and Efroymson et al. (2007) found similar types of result. The number of family members of the respondents ranged from 02-10 with an average score of 4.5 compared to the national average household size is 4.7 (Anon, 2009). The respondents were classified into following three categories (Table 3) followed by Haider (2010) and Ali et al. (2008). Findings displayed in Table 3 depict that about three-fourth of the family belonged to medium size, 21 percent of the respondents had small family, while only 8 percent were large family. It indicates that family planning campaign of the government is not working as it envisaged. Occupation is a person’s usual or principal work or business, especially as a means of earning a living. The respondents were categorized into five different occupational groups viz. housewife, service, business, day labor, others. Findings presented in show that almost all (92%) of the respondents were housewives and 6 percent were involved in service and the rest very tiny portion of them belonged to day laborer and other occupations. Thus, Housewife is the first and foremost occupation of the respondent women. Exposure to information media is considered as another important social capital that facilitates to develop social network, kinship, neighborhood, work groups, interaction and communication. It enriches participants with new information, idea and technologies that create awareness among them. Generally it is said that the higher the access to the information media, the higher is the awareness on any aspect. Information presented in Table 5 indicate the exposure of rural women to 10 different information media namely, health worker, nutrition worker, NGOs worker, SAAO, fisheries assistant, group meeting, listening radio, watching television, and reading newspaper by the respondents. It is evinced that more than half (52%) had low exposure to information media, about two-fifth (41%) showed medium exposure while only 7 percent respondents were evidenced for high exposure. Therefore, a very big mass (93%) of the respondents demonstrated low to medium exposure to information media. Different types of results were reported by Islam et al., (2001) in the study on “Farmers Preference of Mass Contact Media as Agricultural Information Sources”. Women in Bangladesh are economically vulnerable, socially dependent and legally deprived. Patriarchal men are the controller, decision-maker and heads of the families and women are second in command. Crops, poultry, livestock and fish are main sources of income that are more susceptible to natural disaster almost every year. Flood damages their crops, draught hampers yield, and insects attack crops, sometime epidemic of poultry, livestock and fishes. Sometime they become the victims of household violence. Some unpredictable events like, prolonged illness, accidental death of earning member, damage of house, job termination, withdrawal of NGOs support also affect their normal lives. Mallick (1998) in his study further identified some events that women routinely faced including loss of assets, illness, legal expenditures, accidents, death of a family member, theft, robbery, husband’s second marriage, land disputes, disputes with neighbors and husband’s tortures. All these happenings make them more vulnerable. Respondents under the present study were basically poor. They cannot cope well with the unproductive situation with small income and capital. However, women try to cop these shocks in different ways. Women mitigate the crisis by diversifying their economic portfolio, borrowing money and selling off assets (Parveen, 2005). They also lack help from relatives and neighbors when they become the victims of household violence. Women under the study were requested to indicate how much they cope with some unexpected household shocks that disrupted their everyday lives. Results shown in Table 6 indicate that most of the respondents (68%) had low shock reduction ability, about one-fourth (27%) had medium shock reduction ability and only very negligible part of them (5%) had high ability to cope with household shock. Parveen (2005) found different types of result in her study. Husband-wife relation is another factor that essentially needed for family welfare, social welfare, social status and social support as well as social acceptance. Good relationship between wife and husband depends upon their mutual understanding, love and respect as well as friendly behavior. Bad relationship is mainly rooted in some sorts of deprivation by the husbands. Women are the victims of physical and psychological violence by husbands in many cases. Findings pointed out in Figure 3 describe the distribution of rural women according to their relationships with their husbands. The respondents were asked to indicate the level of relationships that exist with their husbands regarding feelings, cooperation, coordination, love and respect. It is evidence from figure 3 more than half (52%) of the respondents noted that they had respectable relation with their husbands, 38 percent of the respondents mentioned co-operative relation with their husbands, 8 percent pointed out that, they had amiable relation with their whereas only 2 percent of them indicated that, they had no good relation with their husbands at all. The respondents felt somewhat hesitated and shy to express this issue. Thus, a gigantic portion of the respondents (90%) indicated cooperative and respectable relationships with their husbands who are very worthwhile for lasting family bond and social peace. This result was different from Efroymson et al. (2006). Though in our society women arc encouraged in their domestic role but they can participate in the trade and business to contribute to the family like Hazrat Khadiza the first wife of Prophet Hazrat Muhammad (Sm.) who owned caravans, which traded between Mecca and Syria. Rising of income is necessary for women to meet everyday needs like schooling cost, purchase of medicine, fruits, cloths and gifts. Women’s involvement in income generation activities (IGA) not only increases their income but also generates some secondary influences on their life and attitude. If women earn more money, they have more prominent role in family’s decision-making with respect to expenditure and other family matters. Such an active participation by women may help to develop their personality as well which help the family it possible to take more judicious decision (Rahman et al., 2002). Findings displayed in Table 7 illustrate the distribution of rural women according to their extent of financial contribution to the family. More than half (55%) of the respondents had little financial contribution followed by 24 percent medium contribution and 21 percent high contribution in maintaining family cost. Low capital, education, training, technology and inputs; more children, domestic workload and social and household restrictions might hamper in their economic contribution to their families. Begum (2001) found contradictory result in her study. Participation in social development programs facilitates rural women to develop social networks through communication, interaction, kinships, and mutual understanding. It also inspires women to involve in the decision-making process. Thus, they become socio-economically empowered. Moreover, there exists a positive relationship between participation of women in the development programs and their empowerment (Schuler and Hashemi, 1995). Twelve social development programs namely, vaccination campaign, sanitation campaign, plantation campaign, political campaign, adult literacy program and acting as a marriage media, mediation of social conflict, attending social cultural function, delivering lecture in social program, distribution of warm cloth to the destitute, arranging meals for the destitute, subscription to any orphanage were taken into consideration in order to measure the extent of respondents’ involvement in social development programs. The respondents were requested to express the extent of their opinion regarding these programs. Respondents were categorized according to their participation in social development Programs (Table 8). It is evinced from Table 8 the more than three-fourth (76%) of the respondents had little participation in social development programs, followed by 22 percent medium participation while 2 percent had high participation. Hence, almost all (98%) of the respondents maintained low to medium participation in social development programs which is substandard. Unrelated findings were reported by Chowdhury et al., (2001). Respondent women’s participation was measured mainly in two dimensions viz. participation in household activities and in agricultural activities. Thus, their involvement in two dimensions has been shown below. In Bangladesh, especially in rural society, all women, educated and uneducated alike generally remain involved in their domestic duties. It is a fact that a family without women is not sustainable. Women are responsible for some activities: washing utensils and cleaning house compound, cooking and fuel collection etc. In the case of homestead work, the daughter assisted more than the son. Others like mother in law, grandmother, parents, and sister in law and servants could help in the work. The husband was always busy with outside work. They spent less time on homestead activities. In most of the house, women prepare the daily food items. Sometimes their husband and children help them. Available findings in Table 9 represent that women mostly participate in cooking food (97%), washing dish (96%) and selection of daily menu (89%) whereas men participation is mentionable in budgeting for food items (73%) and buying of food items (61%) against 24 percent and 31 percent women’s participation, respectively. Paul and Saadullah (1991) found 75% women participate in washing dish and 97% in cooking food. It is worthwhile to mention here that men’s participation is totally absent in cooking food and washing dish. Children’s participation is very low in all food preparation activities except buying of food item (8%). Therefore, respondent women are mainly responsible for preparation of food stuffs for the family members. Findings obtained by Luqman et al (2006) supported the above result. It is greatly observed throughout the Bangladesh that husbands are the only earning member of most of the houses. So, husbands mainly engage in preparation of budget, choosing and buying of cloths for every member of the house. Sometimes they take their wife to choose dress. Some woman thinks it is very bad work to go to the market. Few women rear poultry, some rear goat and cow. From their earnings by selling poultry, goat and cow they spend for buying cloths. Results available in Table 10 show that more than half of the respondents (51%) buy cloth for themselves, about half (48%) of them have freedom of choosing dress followed by 43 percent buy cloth for children, 40 percent buy cloth for relatives, 39 percent buy cloth for husband and only 27 percent respondents participate in allocating budget for buying cloth. On the other hand, a lion part of men (64%) participate in allocating budget for buying cloth followed by buying cloth for relatives (49%) and buying cloth for themselves (47%), choice of dress (39%), buying cloth for children (39%) and buying cloth for wives (30%). Children also mentionably participate in buying cloth for their mother and other female family members (19%), buying cloth for themselves (18%) and buying cloths for their fathers and other male family members (14%). Children are the future of any family. So, parents are always anxious with their children’s educational activities. Now a day’s women are seen more concerned about their children’s education. They maintain unseen competition with other kin and kith women. Findings shown in Table 11 indicate that more than one-third women (34%) participate in children’s education through taking care them at home, followed by selection of private tutor (24%), choice of school (21%) and spending money for education (18%). On the contrary, men’s participation regarding children’s education highest in spending money for education (79%) followed by choice of school (67%) and selection of private tutor (47%). More than half of the children (52%) help themselves in going school and selection of their private tutor (28%). Hence, respondents’ husband showed dominancy over their counterpart women rather children themselves demonstrated more involvement with their educational activities than their mothers. But Afsana et al. (1998) observed another consequence. Cleaning house and selection of household furniture were mainly done by the woman of the house. Choice of house, building home, and purchasing land for building home, repairing house, and repairing household essentials were treated as man’s work. However, findings collected in Table 12 present that a very gigantic portion of the respondent women (91%) involve in cleaning their houses and a mentionable part of them (13%) take part both in repairing house and repairing household essentials. In other housing activities their participation is claimed no description. On the other hand, men show their dominancy in choosing house (96%), purchasing land for building house (95%), building house (91%), repairing house and household essentials (80%). In selection of household furniture, both respondent women and their husbands participate more or less equally with 50 percent and 48 percent participation, respectively. Children rarely participate in housing related activities except to some extent in cleaning house (9%) and each of repairing house and household essentials (7%). Therefore, respondents’ husbands prove their supremacy in housing related activities except a few. Paul and Saadullah (1991) in their study on “Women in Homestead of Small Farm Category in an Area of Jessore, Bangladesh” found 40% women participate in house making. Family planning is a very essential aspect for any family. It helps in taking decision on number of children to be taken, time of reproduction, selection of family planning method etc. Findings compiled in Table 13 indicate that respondent women (74%) dominant over their husband (27%) in choice of family planning method but in selection of reproduction time respondents’ husband (66%) remain dominant over the respondents women (34%) and in case of deciding the number of children to be taken, the situation remains same, i.e., respondents’ husband (60%) and respondents women (40%). Respondent women and their husbands equally take part in deciding the name of their new born baby. Thus, male and female jointly and evenly involve in family planning related activities. Efroymson et al. (2006) found similar result. Women engage with a range of household chores. They themselves are completely responsible for some of these household tasks. Some of the household jobs are jointly performed with their husbands and children. However, Table 14 is arranged with the findings of 19 different household chores. Results displayed in Table 14 show that respondent women by themselves complete cent percent of tailoring and preparation of handicraft for their family. Luqman et al. (2006) found 39% women participation in tailoring and preparation of handicraft. They show their dominancy over their male counterpart in some domestic activities like collection of water (82%), feeding children (72%) and washing/drying children’s cloth (62%). On the other hand, respondents’ husbands are involved with some of the household activities dominantly like, financial investment (93%), purchase of technology (79%), entertainment cost (75%), supporting relatives (75%), managing household budget (72%), marriage of sons and girls (67%), selling of household produces (62%), visiting relatives and friends (65%), inviting guest (62%), payment of electricity bill (56%) and celebrating family events (49%). Children are playing mentionable role in the family. Elder children engage themselves in the family in bathing junior children (39%), washing /drying children cloth (28%), celebrating family events (28%), visiting relatives and friends (27%) and marriage of sons and girls (17%), feeding children (23%) and so on. Therefore, it can be concluded from this Table that respondents women are mostly engaged in in-house activities and their husbands are mainly involved in out-house activities and that need financial connection. FAO (1999) revealed that women contribution in agricultural labor force in developed countries is 31% while their contribution, on the other hand in developing countries is 44%. Women agricultural workers are responsible for half of the world production. They are the main producer of staple crops such as rice, maize, and wheat, which account for 60% to 80% of the food intake in most of the developing countries. They are the key players in day to day agricultural tasks, the instigators of activities that generate agricultural and non agricultural income and the custodians of natural and productive resources. Women workers, who represent more than one-third of the agricultural labor force, are not even mentioned separately in the National Agricultural Policy. They spent much time in post-harvest activities. With some exceptions, notwithstanding, women participated very little in land preparation; transportation and marketing of agricultural produce. Despite their routine domestic work, women are very actively involved in agricultural production in Bangladesh. Women in rural Bangladesh are in general responsible for most of the agricultural work in the homestead. They traditionally undertake home gardening. Farm activities in the homesteads, ranging from selection of seed to harvesting and storing of crops, are predominantly managed by women. Despite women’s important role in agriculture, the traditional social norms and customary laws combined with the purdah system deprive Bangladeshi women of equitable economic opportunities and access to resources. In Bangladesh, especially in poor households, such clearly demarcated gender divisions of labor do not apply. The traditional gender relations with women’s involvement in post-harvest work and men’s in fieldwork have not remained static over time. Presently, due to extreme poverty and a food crisis, social norms and traditions are changing and women are appearing in the field as well (Shirin, 1995). About 60-70% of women from landless and near-landless households work as agricultural wage laborers, whereas women from larger farms do not participate in field activities (Jahan, 1990). In the Grameen Krishi Foundation working areas in North-West Bangladesh, women equally share all tasks in rice production, even the presumably main task of irrigation (Jordans and Zwatreveen, 1997). Findings presented in Table 15 reveal that respondents’ husband i.e., men are mostly involved (64 to 77%) with all the pre-harvest crop production activities including in budgeting for crop production, purchasing agricultural inputs, arrangement of agricultural implements, selection of land, selection of crop, land preparation and cleaning, sowing seed/ transplanting seedling, weeding, irrigation, intercultural operation, determination of harvesting time and harvesting of crop. Respondent women have mentionable participation (13 to 28%) in pre-harvest agricultural activities. Children also are involved (7 to 14%) with pre-harvest agricultural activities based on the necessity of the family. Hence, pre-harvest crop production activities which are physical labor intensive and need technical decision are dominantly performed by the male counter parts of the respondent women. Similar results were reported by Muhammad and Muhibbullah (2010). But Shah and Khan (2004) reported different types of result. Traditionally women in Bangladesh are engaged in post-harvest agricultural activities solely or with their husbands or other male family members from the time immemorial. Though results displayed in Table 16 reveal that husbands of the respondent women play vital role in threshing of harvested crops (85%), carrying products to market (84%) and selling of products (81%) to the market. But respondent women dominantly participate in most of the post-harvest crop production activities which are cleaning and winnowing of separated crop grains (89%), processing of products (77%), sorting and grading of product (73%) and storage of products (66%) in compatible with cultural and social norms and values. Paul and Saadullah (1991) found 97% women participate in storage of products. Children also have little participation (2 to 13%) in post-harvest crop production activities based on their physical ability and family demand as well. Similar results were found by Muhammad and Muhibbullah (2010) and Shah and Khan (2004). Opposite results were observed by Ali et al. (2008). Poultry is very important to rural women, being the only source of income totally under their control. Over 90 per cent of the rural families keep an average of 12 adult birds per family and hatch chicks under a brood hen. The women apply their own methods of rearing, brooding, breeding and management, based on the experience handed down from the elder family members. A research study conducted in Punjab revealed that rural women were involved in activities like feeding poultry (49.6%), watering poultry birds (48.0%) and collection of eggs (44%). More than 50 per cent of rural women spend more than eight hours daily in performing livestock and poultry activities (Anon., 2011). In the study area 63 families had poultry out of 90 families. The findings presented in Figure 4 depicts that woman participation is 100 percent in collection of poultry, feeding poultry, taking care of poultry. But their counterpart husband play vital role in selling of eggs and poultry with 68 % and 67% participation, respectively. Very little participation of children is traced out in selling of eggs and poultry. Paul and Saadullah (1991) found that 70% women participate in selling poultry and by products. Goat nurturing by rural women is an integral part of different farming system in Bangladesh. The goat probably is the only animal in Bangladesh, which is managed for multiple end uses such as meat, hides, milk and manure. It provided one of the main sources of income for the farmer. It is a major contributor of protein and fat. Often the goat enterprise could help farmers to overcome an unforeseen crisis, which demands immediate finance. Goats in general were hardy animals and in wild or semi domesticated state. They rarely suffer from serious disease and quite easy for woman to manage them. The woman used the sale proceeds to meet the cost of cultivations, purchase of food, for housing, clothing, social activities, educational expenses and purchase of land. In Bangladesh livestock is used as a tool for poverty alleviation. In several countries small ruminant’s enterprises could be first step in poverty alleviation for the poorest rural women and their families. Entire family got more benefits from an income belonging to a woman than an income belonging to a man. Livestock is an important source of fuel, food and supplementary income for the farm family. Out of 90 respondents, 13 rear goat while 47 of them rear cow. Information presented in Figure 5 indicate that the respondent women have highest participation in collection /purchase of goat (92%) followed by rearing and milking of goat (77%). In case of cow women mostly involve in rearing (95%) followed by collection /purchase of cow (89%). Therefore, women are going on performing vital role in livestock rearing. Fishing is predominantly artisanal although there is an industrialized processing sector geared to export. Rice and fish constitute principal elements in an average person’s daily diet. Women in Bangladesh have diversified roles in fisheries, with substantial participation in small-scale fisheries. In Barisal and Rajshahi districts, women are directly involved with catching fish. To a large extent, they carry out the drying, curing, and marketing of fish as hawkers, stall keepers in permanent market places and weekly bazaars. The majority of the employees in shrimp processing plants in Chittagong and Khulna are women. Women are also predominantly involved in net-making, the main income generating occupation in many families, and freshwater fish farming (FAO, 1980). In some NGO and government programs, women from landless households cultivate fish individually or jointly in leased ponds, either within or near the homestead (Jahan, 1990). But in the study area respondent women participate in fishing is very negligible. Ibrahim and Yahaya (2011) observed contradictory result. Coefficients of correlation (r) were computed in order to explore the relationships between relationship between selected characteristics of rural women and their participation in household and agricultural activities and have been presented below. Coefficients of correlation were computed in order to explore the relationship between selected characteristics of the respondents and their participation in household activities. The null hypothesis was “There is no significant relationship between the selected characteristics of rural women and their participation in household activities.” Relationships between the selected characteristics of the respondents and their participation in household activities are given in Table 17. It is evinced from the Table 17 that media exposure, shock reduction ability, contribution to purchase and participation in social development activities had positive significant relations with their participation in household activities. It indicates that if there is any increase in the above mentioned selected characteristics of the respondents, there would be an augmentation in their participation in household activities. On the other hand, husband wife relation showed negative significant relation with their participation in household activities. It indicates that if there is any increase in husband wife relation, there would be a decrease in their participation in household activities. Media exposure had positive significant relationship with their participation in household activities. It means that the higher the media exposure of the respondents, the higher their participation in household activities. Roy et al. (2009) found different result in the study on “Farmers Perception of the Effect of IPM towards Sustainable Crop Production”. Shock reduction ability had positive significant relationship with their participation in household activities. It means that the higher the shock reduction ability of the respondents, the higher their participation in household activities. Ahmed et al. (2009) found opposite result. Husband wife relation had negative significant relationship with their participation in household activities. It means that with the decrease in husband wife relationship. There is increase in their participation in household activities. This might be due to when husband wife relationship is in bad relationship is in bad condition wives try to be sincere in their household activities to avoid any further unwanted and worsening situation. Contribution to purchase had positive significant relationship with their participation in household activities. It means that the higher contribution to purchase of the respondents, the higher their participation in household activities. Participation in social development activities had positive significant relationship with their participation in household activities. It means that the higher the participation in social development activities of the respondents, the higher their participation in household activities. Karim et al. (2009) observed different result in the study on “Farmers Perception of Quality and Marketing System of RDRS Seed”. Women in rural Bangladesh along with their husbands also participate in agricultural activities. Relationships between the selected characteristics of the respondents and their participation in agricultural activities have been tested and are shown in Table 18. From the results presented in Table 18 evince that all the selected characteristics of the respondent women showed insignificant relationship with participation in agricultural activities. It indicates that irrespective of the age, education, family size, occupation, shock reduction ability, husband wife relation and media exposure of the respondent women, their participation in agricultural activities more or less similar.. However, the relationships were positive with their age, occupation, shock reduction ability, husband wife relation and contribution to purchase which were negative with education, occupation and media exposure. But observation obtained by Anjuman et al. (2009) does not support the findings. In practical everyday life women confront some problems both at house and in the field. However, major five problems mentioned by majority of the respondent women are lack of enough resources; negligence by the family member; lack of knowledge on improved crop production; age difference between spouse; and lack of control over the family members (Table 19). In Bangladesh, most of the communities are patriarchic and in male has power over all resources, therefore, women having no or less possession over the resources both at father’s and husband’s houses get less scope to control over any resource. As women are physically weak and thereby mentally too, and so are neglected by the other members of the family. In the same way, women exert lack of control over the family members. Again women are traditionally engaged with agriculture without sufficient knowledge on crop production, protection and storage. Therefore, they face manifested problems especially in agriculture. It is said that like born and death, forming couple as husband and wife is the desire of the Almighty. But there are lot of activities including reproduction of children influenced to a great extent by the compatibility of husband and wife. If the wife is too much junior to her counterpart husband then there exists incompatibilities in sharing ideas, understanding each other, therefore, creates disequilibrium in their couple life. Surprisingly, no respondent indicated any problem related to agricultural activities. It might be due to their realization as agriculture is their secondary working field. And they with their scanty knowledge on agriculture did not dare to indicate any problems as well as suggest any solution. Bangladesh is one of the densely populated countries in the world. She is bearing 142.3 million of people in her 1, 47,570 sq km of areas. Out of them, about fifty percent (105:100) are female. They are the key operator of the house. They play an important role in domestic duties such as washing utensils, cleaning house compounds, livestock and poultry management and feeding, as well as post-harvest activities, guest entertainment, decision making and technology adoption. In addition, rural women do some productive activities including agricultural within the homestead. They also engaged in various activities related to livestock production like production of animals, sales of animal’s and by products, cleaning, watering and bathing the animals. In Bangladesh, women are in general responsible for livestock and poultry rearing. Poultry rearing is a traditional activity performed by women for income generation. Three villages named Kanaia, Nilerpara and Chakuli of Gazipur sadar upazila were selected as the locale for this piece of study. Thus, a total of about 445 housewives were considered as the population of the present study believing that each family contained only one housewife. And from them ninety housewives were randomly selected as sample. The SPSS/PC + computer program was used to perform data analysis. Descriptive statistical measures like range, mean, number and percentage distribution, standard deviation were used to describe and interpret the data. For exploring relationships between any two variables Coefficient of Correlation (r) was employed. Most of the respondents (62%) were young aged while 36 percent belong to the medium and old aged categories. About 91 percent of the respondents had literacy. About three-fourth (71%) of the family belonged to medium size, 21 percent of the respondents had small family, while only 8 percent were large family. Almost all (92%) of the respondents belonged to housewives category. A very big mass (93%) of the respondents demonstrated low to medium exposure to information media. Most of the respondents (68%) had low shock reduction ability, about one-fourth (27%) had medium shock reduction ability and only very negligible part of them (5%) had high ability to cope with household shock. Larger than half (52%) of the respondents noted that they had respectable relation with their husbands, 38 percent of the respondents mentioned to have co-operative relation with their husbands, 8 percent pointed out that they had amiable relation with their whereas only 2 percent of them indicated to have no good relation with their husbands at all. Greater than half (55%) of the respondents had little financial contribution followed by 24 percent medium contribution and 21 percent high contribution in maintaining family cost. Bigger than three-fourth (76%) of the respondents had scanty participation in social development programs, followed by 22 percent medium participation while 2 percent had high participation. Available findings represent that women mostly participate in cooking food (97%), washing dish (96%) and selection of daily menu (89%) whereas men’s participation is mentionable in budgeting for food items (73%) and buying of food items (61%) against 24 percent and 31 percent women’s participation, respectively. Results show that more than half of the respondents (51%) buy cloth for themselves, near about half (48%) of them have freedom of choosing dress followed by 43 percent buy cloth for children, 40 percent buy cloth for relatives, 39 percent buy cloth for husband and only 27 percent respondents participate in allocating budget for buying cloth. Better than one-third women (34%) participate in children’s education through taking care them at home, followed by selection of private tutor (24%), choice of school (21%) and spending money for education (18%). A very gigantic portion of the respondent women (91%) involve in cleaning their houses and a tiny mentionable part of them (13%) take part both in repairing house and repairing household essentials. Big majority of the respondent women (74%) dominant over their husband (27%) in choice of family planning method but in selection of reproduction time respondents’ husband (66%) remain dominant over the respondents women (34%) and in case of deciding the number of children to be taken, the situation remains same, i.e., respondents’ husband (60%) and respondents women (40%). Respondent women and their husbands equally take part in deciding the name of their new born baby. Women by themselves complete cent percent of tailoring and preparation of handicraft for their family. They show their dominancy over their male counterpart in some domestic activities like collection of water (82%), feeding children (72%) and washing/drying children’s cloth (62%). Respondent women have mentionable participation (14 to 28%) in pre-harvest crop production activities. Respondent women dominantly participate in most of the post-harvest crop production activities which are cleaning and winnowing of separated crop grains (89%), processing of products (77%), sorting and grading of product (73%) and storage of products (66%) in compatible with cultural and social norms and values. Woman participation is 100% percent in collection of poultry, feeding poultry, taking care of poultry. Respondent women have highest participation in collection /purchase of goat (92%) followed by rearing and milking of goat (77%). In case cow, women mostly involve in rearing (95%) followed by collection /purchase of cow (89%). In the study area, respondent women‘s participation in fishing is very negligible. Occupation, media exposure, shock reduction ability, contribution to purchase and participation in social development activities had positive significant relationships with women’s participation in household activities. Husband wife relation had negative significant relationship with their participation in household activities. No significant relationships were observed between participation in agricultural activities of the respondent and their selected characteristics. It is very important to make logical interpretation of the findings of the study and to draw a meaningful conclusion. The researcher, in her research, studied the women participation in household and agricultural activities attentively and put forward the following conclusions on the basis of following major findings. A big mass (91%) of the respondents had educational literacy. Almost all (92%) of the respondents belonged to housewives category. A very big mass (93%) of the respondents demonstrated low to medium exposure to information media. Almost all (98%) the respondents maintained well relationships with their husbands. About four-fifth (79%) of the respondent had low to medium financial contribution to family. Bigger than three-forth (76%) of the respondent had little participation in social activities. Respondent participation was highest in indoor activities. Their participation was higher in child care than husband. But decisions related educational activities are mainly taken by respondents’ husband. Respondent women’s participation was low in pre-harvest crop production but their participation was high in post-harvest crop production activities especially in cleaning and winnowing of the separated crop grains, processing of products, sorting and grading products, and storage of products. Respondent participation was greater in collection, feeding, taking care of poultry and livestock but very low in selling of poultry and livestock. Occupation, shock reduction ability, contribution to purchase, and participation in social development activities had positive relationships with their participation in household activities but husband-wife relation showed negative relationship. Major five problems mentioned by majority of the respondent women were lack of enough resources; neglect by the family member; lack of knowledge on improved crop production technologies; age difference between spouse; and lack of control over the family members. Based on the conclusions drawn from the findings, the following recommendations have been put forwarded. Arrangement of vocational training on income generating activities especially on tailoring, preparation of handicrafts, modern poultry raising and modern vegetable production in the homestead area by GO and NGOs. Programs should be taken for increasing women’s knowledge on post harvest activities especially on winnowing, drying, sorting and storing of grains. Increasing awareness among the people on the importance of women’s contribution to household works. The present study was conducted in Gazipur sadar upazila under Gazipur district. Similar study may be conducted in other areas of Bangladesh. Only nine independent variables were considered in the present study. Other variables like agricultural knowledge, training experience, cosmopoliteness etc may be considered in further research for measuring women’s participation in household and agricultural activities.